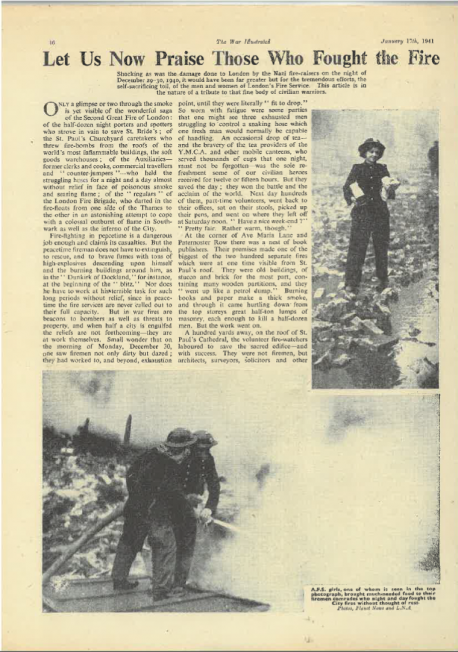 Article scanned from a copy of ‘The War Illustrated’ brought in by one of the Kenley Revival Project volunteers, the article is talking about those women who joined the AFS (Auxiliary Fire Service) during WW2, fighting all the fires after raids and more. Helping with food supplies as well as physical work, the top image depicts a woman standing holding a few bags of food, whether she is collecting it up or bringing it to people, as you can see women were still expected to dress well, her hair is nicely pinned and she is flashing a smile to the photographer. The bottom image, you can see two women hard at work using the fire hose to put out some smoldering wreckage.